Digital Brighton & Hove recently ran a day of ‘digital discovery’ for local charities and social enterprises keen to embark on their digital journey and start turning initial interest into action. Bringing together over 65 representatives from the local third, public and private sector over two half-day sessions, the day served as a good reminder that the digital revolution has indeed happened and that ‘going digital’ is no longer a niche idea for the local third sector, but rather a necessity. With plenty of appetite and engagement on display, the question is not so much if change is on the horizon but rather how to make that change happen for our local sector. Ellie Hale from the Centre for Acceleration of Social Technology (CAST) made a convincing case on why digital matters for charities and social enterprises. We’ve seen a number of recent reports from the likes of the Skills Platform, Tech Trust and Lloyds Banking Group showing growing recognition across the sector of the importance of digital. SCVO’s Creating a Digitally Confident Scotland and the government’s Civil Society Strategy have also placed a strong emphasis on building the sector’s digital capacity. “Although many charities use social media and sites like Just Giving to spread campaigns or engage donors, they’re largely missing an opportunity to use digital to better understand and respond to the changing needs and context of the communities they serve. They haven’t yet entered this new age yet”. The free Design Hop workshop run by CAST in the afternoon was a first opportunity to change this mindset – rather than focus on specific digital solutions, the session offered a simple step-by-step approach to designing services which put users front and centre. With around 2,300 voluntary and community organisations in Brighton and Hove under increasing pressure to provide more effective and better services, there is recognition from key stakeholders that something needs to happen… and fast. Over 600 of those organisations are members of Community Works, which plays an important role in helping build their capacity by providing advice and support. Jess Sumner, CEO of Community Works, explained in a panel discussion that digital was becoming increasingly important for both Community Works (as a leading organisation in the sector) and its members – for instance, a new ‘Digital representative’ has recently been appointed to gain a better understanding of the needs of the sector when it comes to digital, and how to best support them. The growing importance of digital skills in the sector is also being increasingly recognised, alongside other skills like business development and fundraising. Meanwhile, John Reading who oversees Brighton and Hove City Council’s Third Sector Investment programme, encouraged the sector to work even more collaboratively and creatively through new forms of cross-sector partnerships. 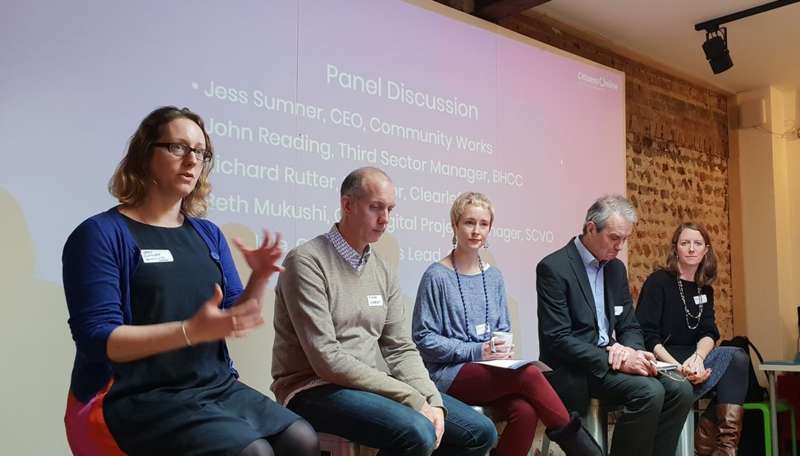 A panel of experts: Jess Sumner (Community Works), Richard Rutter (Clearleft), Ellie Hale (CAST), John Reading (BHCC) and Beth Mukushi (SCVO Digital). This is a need that we recognise locally. The core of Digital Brighton & Hove’s work has been to embed digital champions (currently over 400) across different public services already going through some form of digital transformation – in other words, where digital inclusion forms part of a broader organisational digital strategy. Things can become more challenging when applying the same embedded digital champion approach to those organisations who are at a very early stage of their digital development. And with 45% of charities without a digital strategy, this constitutes many of the organisations we collaborate with. For some of these, we’re running the risk of digital inclusion becoming just a ‘bolt on’ activity. Building on the digital training we provide mainly for frontline staff, an important need is therefore to boost the digital confidence of a whole organisation, including its leaders and trustees. And at the heart of this lies digital skills. Research findings from the Charity Digital Skills Report 2018 show that 53% of charities see their digital skills as fair or low, with 65% stating that developing digital skills would help encourage and retain staff (Charity Digital Skills report 2018). Meanwhile, our own research shows that 16% of adults living in Brighton & Hove don’t have basic digital skills. Those at risk of being left behind aren’t just the service users but also the staff who are supporting these service users – and potentially a whole sector is at risk of falling behind. We often hear of the ‘blockers’ that prevent change from happening (lack of funding, skills, etc. ), but there are also many opportunities to take a first simple step. A recurring theme during our session was the power of networks in providing a space to share good practice among different stakeholders, and helping them to connect with the local digital sector. The good news is that such a space is fast emerging in Brighton & Hove. On top of our Digital Inclusion Network which comprises over 200 organisations, mainly from the public and third sector, we’ve recently launched our sister network Tech for Good Brighton, with the aim of engaging more closely with digital agencies. Set up as an experiment during Brighton Digital Festival 2018, its aim is to see how we might bring together our vibrant digital sector and social sector, and together explore how digital technologies can create more social impact locally. Counting over 350 members, it’s become the fastest growing Tech for Good community in the UK. Richard Rutter, Founder of Clearleft, one of Brighton’s leading digital agencies and supporter of Tech for Good Brighton, explained during the panel discussion that he sees it as an exciting opportunity to find out how local digital agencies can use their expertise and talent to help local social projects. And with more local digital agencies and other businesses coming on board, we could be looking at next army of ‘ready-made’ digital champions helping to make this change happen locally! There are a number of other sector-wide initiatives and resources to help charities start their digital evolution, from the Charity Digital Code of Practice to NCVO’s Digital Maturity Matrix to CAST’s digital design principles. The Charity catalogue is great to find out more about digital tools and this Conversation Menu is also helpful when starting that conversation with your digital partner. There is a growing number of grant funders who are now actively supporting digital, with ever-growing pots of funding including the National Lottery’s Digital Fund and Comic Relief. Interested in finding out more about Digital Brighton & Hove? Please sign up to our newsletter or get in touch with David Scurr.